Please click here to buy the TI-Voyage 200 on Amazon. Probably the most powerful graphing calculator on the market today is the TI-Voyage 200. The TI-Voyage is the phoenix born from the ashes of the TI-92. After a nice run by the TI-92, Texas Instruments decided it needed a makeover. So it slimmed it down, upped the processing power, gave it a stylish new case, and designed it to run on lighter AAA batteries instead of AA’s, and, Presto!, the TI-Voyage had arrived. The Voyage is the ultimate geek/prodigy toy, and I wanted to take some time to give it a thorough review. I’ve been a fan for years because there’s just nothing else like it on the market. From a CAS to QWERTY keyboard to 3D graphing, this calculator is packed with power. Who is the TI-Voyage 200 designed for? Power users. If you need a top of the line graphing calculator with every possible bell and whistle, look no further. TI-Voyage users tend to be students who like to take their math explorations further. Parents sometimes give it as a gift to encourage the prodigy math student. They are popular among college math professors and those that like to program their graphing calculators. The Voyage is actually so powerful that it’s been banned from virtually every standardized test, but hey, you wouldn’t get an indy car and expect to get to drive it down the freeway either, right? Why do I recommend the TI-Voyage 200? I love it’s power set of features. First off, the full QWERTY keyboard is virtually unheard of in the graphing calculator world–no hunting around for the alpha key here. You can just type in letters as needed. It’s really nice that those letter keys can be used as variables as needed. Surprisingly, on a lot of graphing calculators, there are two “X” keys, one for the letter x and one for the variable x. You don’t have to mess with that on the Voyage. Second, there’s the CAS. The Voyage has a very nice, easy to use, Computer Algebra System. This means it can solve equations, factor, simplify trig expressions, and much more. The drop down menu system makes it easy to do. I also am a big fan of the app system. Long before the iPhone and Android, the TI-Voyage had an app system with graphical icons representing apps. Most of these apps are available free on the Texas Instruments website. 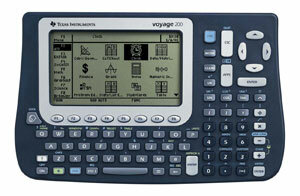 Of course, no top of the line calculator would be complete without 3D graphing, and the TI-Voyage delivers. When it comes to rotating your 3D graph to inspect it from various viewpoints, the TI-Voyage renders it smoothly and quickly. If you’re a math geek who has a love for technology, enjoys showing off your gadgets, or plans to spend your afternoons programming your calculator, the TI-Voyage is the way to go. This has been TI’s most powerful calculator for almost a decade, and it’s just a valuable today as the day it was released.